When creating a layout, arrange your tent city in a simple grid with space numbers that are easy to understand. Create a map that is accessible to your guests and staff so that everyone knows where to find what they’re looking for. Be sure that there is easy access to parking. You’ll also want to decide whether you’ll allow vehicles to enter the tent city. If so, will vehicles be allowed during the event or just before and after? Make the aisles between the tents wide enough for the foot traffic or vehicle traffic you’re expecting. And, don’t forget to have an evacuation plan in case of an emergency. If possible, size your tent spaces at least 8’ larger than the tent size. This allows room for stakes and ropes and keeps the space from becoming crowded. For example, if you want to put a 20 x 20 tent in a space, make it 28 x 28. Next, decide how you’ll be reserving tents for each space. Will the group in each space reserve their own tent with a tent company or will they reserve through your organization and you reserve the tents? Either way can work, but if you’re looking to raise funds, this can be an opportunity for you to mark up the tent rental a bit. When planning an outdoor event of this magnitude, think about your people’s needs. Restrooms: are basic portable restrooms sufficient or would you prefer more elegant restroom trailers? Power: is there power on site or will generators be necessary? Renting quiet generators will make your guests more comfortable. Just having generators may not be enough. 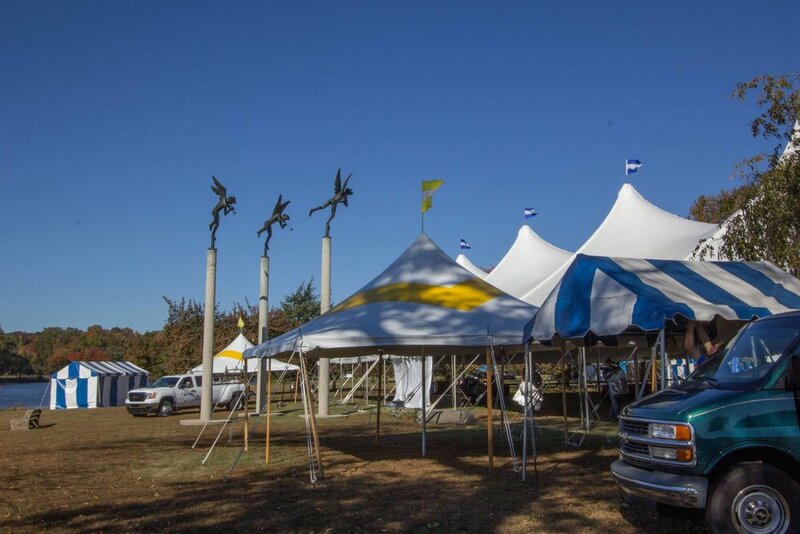 If each tent needs power, be sure to have a plan to distribute the power. Do you have a place for guests to safely charge their electronics? Be sure to keep people well fed and hydrated. You can call in a few food trucks or a caterer. Charging each vendor a fee can be another good source of revenue. Don’t forget to have plenty of bottled water available. This is even more important during hot weather. If there will be children at your event, think of activities that they would enjoy. Kids of all ages love a bounce house! Do you need Wi-Fi? Whether you want to cover the entire area or just a VIP or headquarters area, engaging a professional with experience in covering outdoor areas can ensure that your guests will have a great experience. Temporary headquarters: A place where people can go for help to find their space or a lost child . A way to contact your staff onsite: If you don’t want to spend the money to rent two-way radios for your staff and volunteers, create a list of their phone numbers to make your life easier during the event. Trash collection: place plenty of trash or recycling bins around the venue to keep it looking clean and neat. Schedule a local sanitation or recycling company to remove waste after the event. Here’s an important one: plan for rain. While we all hope for lovely weather, having a plan for your guests in case of rain is very important. Is there a rain date? Will outside activities move into a tent or indoors? Planning these things ahead of time will allow you to rest easy as the event approaches. If you plan to hold the event rain or shine, ask your guests to dress for the weather. Volunteers are an important part of any large event. Securing and training volunteers to staff your event is very valuable. Giving your volunteers shirts and nametags for the day of the event is also helpful. It’s also important to have a timeline for your event so that everyone knows where they need to be and when. Be sure to communicate this to each volunteer and staff member. Permitting: you may be required to secure a special event permit, tent permit, food permit, electrical permit, street permit or other authorization from your local municipality. After the event: plan for an adequate staff to clean up after the event. You can ask your guests to pick up after themselves as well. There’s nothing worse than having everyone go home leaving you with a giant mess on your hands. Be sure that all your vendors such as food trucks, and rental companies don’t leave trash behind. Finally, make it better. Poll your attendees for ideas on how to improve your event for next year. Meet with your staff and make plans for your next event. That way you can continuously improve. Happy planning!